As the last remaining SUV in the midsize segment with traditional body-on-frame architecture, the 7-passenger Nissan Pathfinder offers an impressive 7,000-pound towing capacity and superb off-road performance. To satisfy the market's growing demand for SUVs with car-like driving characteristics, the 2013 model year Pathfinder will receive a major overhaul in the form of unitized body construction. The Nissan pathfinder- a great overall vehicle. My Nissan pathfinder is a great vehicle. I bought it new and have owned it since. It is a very reliable vehicle, never had any major problems at all. It is a very roomy vehicle for our big family and extremely comfortable to drive. It handles very good in all road conditions and of course great in the snow with the four wheel drive option. The backup camera is a big plus tool. The seats go down very was making it very comfortable to each the back then put the seats back in for the kids. It has been a very comfortable reliable vehicle and I am not very quick to get a different vehicle. Wonderful low maintenance vehicle great for families. I love driving this 4WD vehicle. The performance is wonderful and I have not experienced any major or minor issues with the vehicle. I usually conduct all of my own repairs as well for minor items such as oil changes, brakes, etc. And have not had any trouble accessing any of the area of the vehicle. The third row seat functionality allows for a total of 6 passengers which is great for a small family. Modern alternative to the minivan. I love my Pathfinder, with a growing family with children and pets, needing space and more seating, and not wanting to get a minivan this was a great alternative. My one thing I wish I could change is the 3rd row seating, I would not recommend it for a big teenage or a adult, but good for kids, just wish there was more leg room. Old vs New Pathfinder Drag Race: We Didn&#39;t See This Coming! 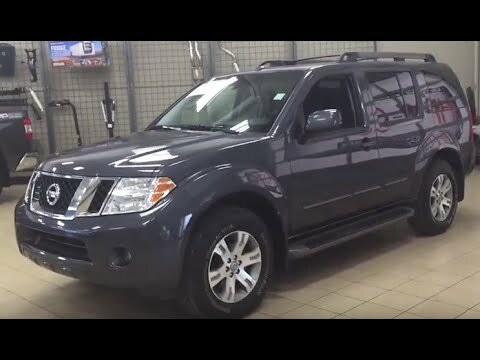 Nissan is recalling certain model year 2012 Frontier, Pathfinder, and Xterra two-wheel drive vehicles manufactured from June 19, 2012, through July 12, 2012. These vehicles may have been equipped with front wheel hubs that may not meet the design hardness specifications. A wheel hub that was manufactured below hardness specification may wear prematurely and eventually crack. If the vehicle is driven in this condition, the wheel hub may break, possibly resulting in a vehicle crash. Nissan will notify owners, and dealers will replaced the left and right side front wheel hub assemblies free of charge. The safety recall is expected to begin during October 2012. Owners may contact Nissan Customer Service at 1-800-647-7261. NISSAN IS RECALLING CERTAIN MODEL YEAR 2011 INFINITI FX, MODEL YEAR 2012 INFINITI M, MODEL YEAR 2011-2012 NISSAN FRONTIER, MODEL YEAR 2011-2012 NISSAN XTERRA, MODEL YEAR 2011-2012 NISSAN PATHFINDER, AND MODEL YEAR 2012 NISSAN NV VEHICLES. SOME OF THE BOLTS THAT CONNECT THE ENGINE OIL COOLER AND THE ENGINE OIL FILTER TO THE ENGINE IN THESE VEHICLES MAY HAVE BEEN MANUFACTURED TO BELOW SPECIFICATION STRENGTH. AS A RESULT, THE BOLT MAY BREAK AT THE OIL FILTER ATTACHMENT POINT AND CAN CAUSE AN ENGINE OIL LEAK. IF THERE IS AN ENGINE OIL LEAK, THE ENGINE OIL PRESSURE WOULD DROP AND THE ENGINE COULD SEIZE, INCREASING THE RISK OF A CRASH. NISSAN WILL NOTIFY OWNERS, AND DEALERS WILL REPLACE THE CONNECTOR BOLTS FREE OF CHARGE. THE SAFETY RECALL IS EXPECTED TO BEGIN ON OR ABOUT JANUARY 19, 2012. OWNERS MAY CONTACT NISSAN AT 1-800-647-7261.